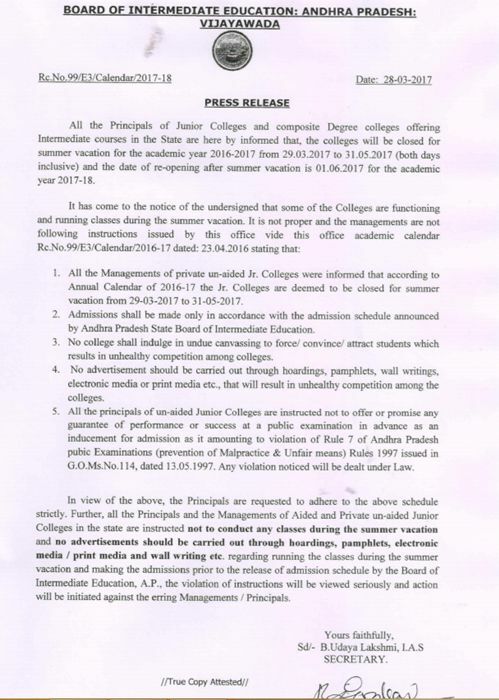 AP Inter Board Summer vacation for the academic 2016-17: All the Principals of Junior Colleges and composite Degree colleges offering Intermediate courses in the State are here by informed that, the colleges will be closed for summer vacation for the academic year 2016-2017 from 29.03.2017 to 31.05.2017 (both days inclusive) and the date of re-opening after summer vacation is 01.06.2017 for the academic year 2017-18. 1. All the Managements of private un-aided Jr. Colleges were informed that according to Annual Calendar of 2016-17 the Jr. Colleges are deemed to be closed for summer vacation from 29-03-2017 to 31-05-2017. 2. Admissions shall be made only in accordance with the admission schedule announced by Andhra Pradesh State Board of Intermediate Education. 3. No college shall indulge in undue canvassing to force/ convince/ attract students which results in unhealthy competition among colleges. 4. No advertisement should be carried out through hoardings, pamphlets, wall writings, electronic media or print media etc., that will result in unhealthy competition among the colleges. 5. All the principals of un-aided Junior Colleges are instructed not to offer or promise any guarantee of performance or success at a public examination in advance as an inducement for admission as it amounting to violation of Rule 7 of Andhra Pradesh pubic Examinations (prevention of Malpractice & Unfair means) Rules 1997 issued in G.O.Ms.No.114, dated 13.05.1997. Any violation noticed will be dealt under Law. In view of the above, the Principals are requested to adhere to the above schedule strictly. Further, all the Principals and the Managements of Aided and Private un-aided Junior Colleges in the state are instructed not to conduct any classes during the summer vacation and no advertisements should be carried out through hoardings, pamphlets, electronic media / print media and wall writing etc. regarding running the classes during the summer vacation and making the admissions prior to the release of admission schedule by the Board of Intermediate Education, A.P., the violation of instructions will be viewed seriously and action will be initiated against the erring Managements / Principals.